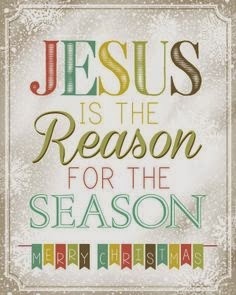 As we celebrate Christmas, let us all be reminded that Jesus is the reason for the season, as this day reminds us that a saviour was born. Christmas is a special season to celebrate as this day normally reunites the whole family. It is nice to know that there is a special occasion each year where all people are hoping to be reunited and celebrate with the family. This is an important day of the year where all members of the family gather together in love and unity. Christmas is not only about exchanging of gifts, going out on a date, eating all the sumptuous foods and decorating our homes with special Christmas decorations. While all of these are part of the celebration, the true essence of Christmas is for us to be reminded that Christ wanted us to be all united in peace and harmony and that love be always felt in our hearts despite of all difficulties and challenges. Our Lord and Saviour, Jesus Christ wanted us to put a smile on our faces as we keep his promise of eternal salvation. He wanted us to remain stable and happy as there is always a promise of hope for a better tomorrow. Marry Christmas from our home to yours!